We made Vegan Kebab, because we love life and we love food! We worked hard to make it delicious! We developed recipes in the most popular versions: Adana and Doner, Kofte and Shawarma , Souvlaki and Gyro. All of them are deliciously seasoned with spices such as paprika, coriander, cumin and complemented with condiments such as garlic and onions and herbs such as parsley, oregano and thyme. Our vegan foods are healthy and high in omega plant based oils in place of animal fat. A wheat and plant based version which mimics meat and provides high levels of protein and fibers which feed the body and support the digestive system. They are very easy to prepare -from box to plate in less than 30 minutes- in a few easy steps and a low price per weight! Environment friendly storage that does not require refrigeration! 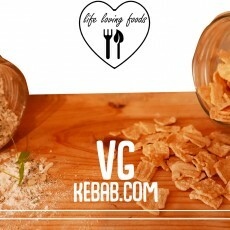 We hope we’ll manage to convert meat kebab lovers into vegan kebab lovers! And that our vegan kebabs will substitute meat consumption and that they will help convince people to join our healthy vegan lifestyle, benefiting both the body and soul, respecting and preserving the environment. Join us and our life loving foods!